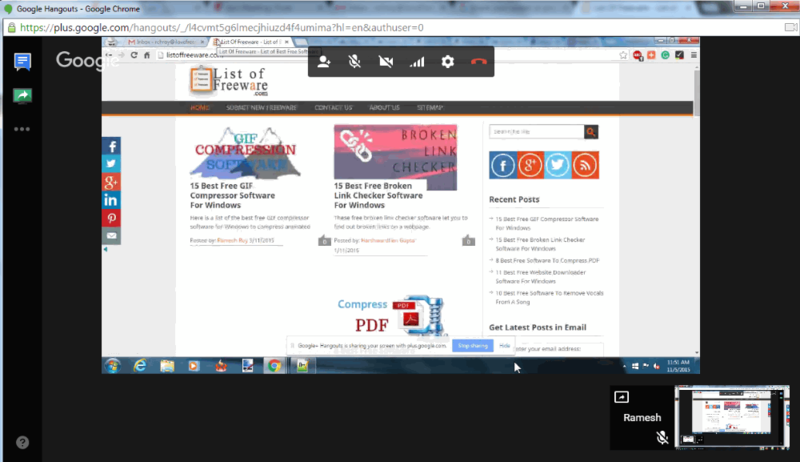 Here is a list of the best free Screen Sharing Websites. 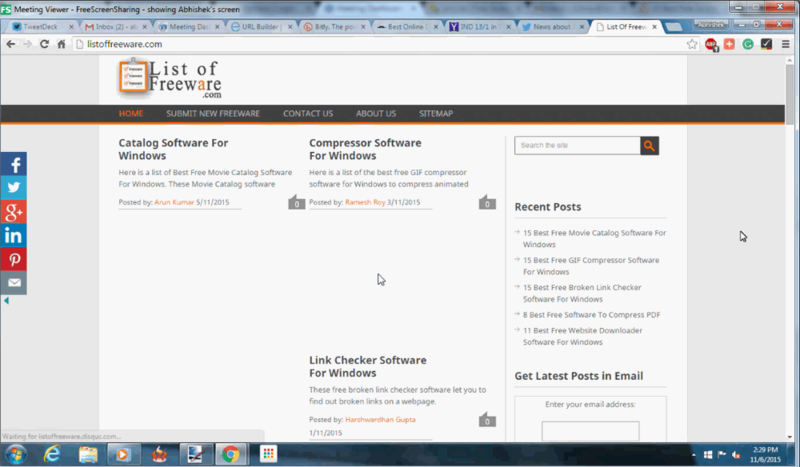 The best part of these websites is that you don’t have to download any software in order to share your screen. You can do it right from the browser. Some of these websites also let you have remote access on other computers, and also let you solve other peoples PC problems or get help from others. These are quite easy to use. Some of these online screen sharing websites do not even require you to register. 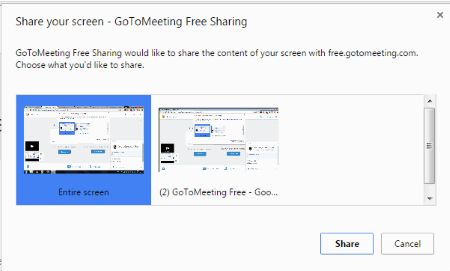 The screen sharing website that I liked the most is GoToMeeting Free. The best part about this is that you don’t have to even register into the website, and you can easily choose an option to generate a link of your choice, and then share it with your members. You can also chat and share the document files with the team members. You can also send meeting invitations. You can also check out the list of Screen Sharing Software, Remote Access Software, and Screen Recorder Software. Here you have to simply select the option to start a meeting. After that a link is generated which you can share with the person with whom you want to start the meeting. On clicking the link, three other guys can hold a meeting with you, and you can share your screen. You can also set the agenda for your meeting where you can set the time limit. Then you can share the screen, chat with the members, and share documents like PDF, Word, Excel, and PowerPoint. 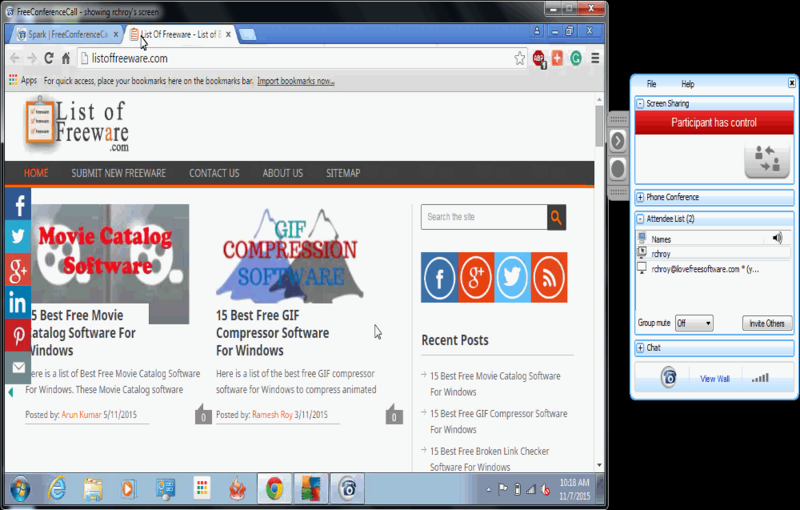 While sharing the screen you can also choose whether to share the whole screen or the current browser window. Also this site requires no sign in or sign ups; it provides you the benefit of getting your option to set your own personal room and lets you see when the persons are online. You can sign in with Google, and Facebook. There is also an option provided to schedule your meeting where you are provided with three options: Add meeting links to Google Calendar with the Chrome Extension, Add meeting invitations with Outlook extension, Copy invitation link and paste into calendar appointment. Here you have to register with the website, and then login to the website. 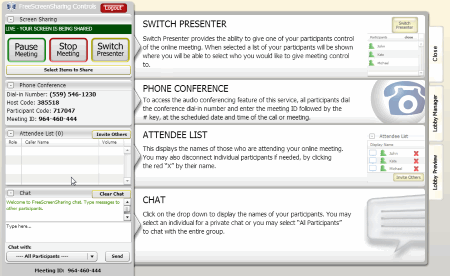 You can then choose the option to choose to host the meeting right at the moment, or schedule it for some time later. You can generate your own custom URL as per your wish. Then you can invite the members, and send them requests. The user who wishes to join the conference has to simply enter the URL, and enter the name. Then after the permission is granted from the host they can join the conference. Any one can choose to host their screen and a permission is requested if you want to see the screen. You can also choose the option of call recording. Any one can see the viewers available, but the host is provided with some extra privileges like: to name the call, invite members, record the meeting, mute all, lock, and leave the conference. The conference can also be viewed on mobile. 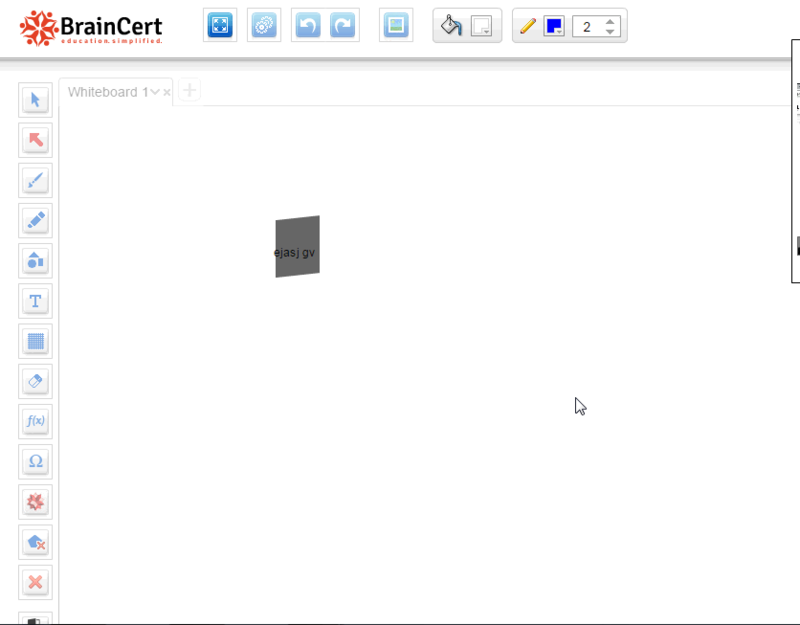 BrainCert is a simple website which lets you share the browser screen for free. It can be used for teaching purposes and can be used to share presentations. In order to do that, you have to register for a free account, and then enter the details. Then you have the option to start a class where you have to input the details of the class. Then you can start the class where you can share the screen and the screen activities is also displayed in the other window. The settings can be changed to view the activities in a full screen window. You can also raise hands to provide notice to the teacher. You can also chat with the students. When the allotted time is about to end, you are notified in advance, and then you can choose the option to extend the time limit. If required the other users can be removed and the microphone and webcam can be enabled or disabled. 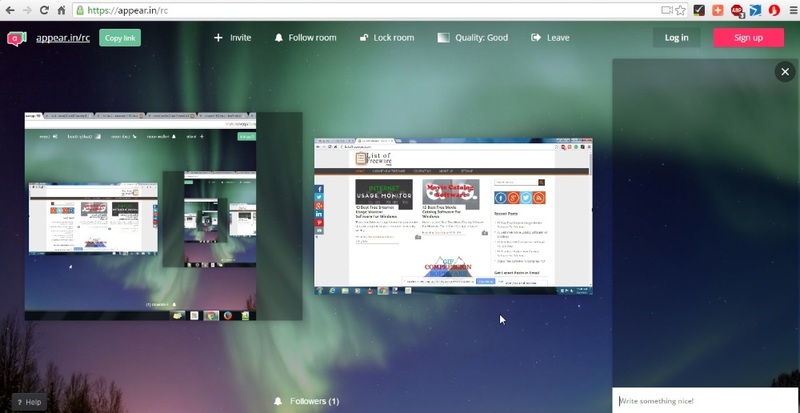 screenleap is a simple website which lets you share screen online for free. In it you have to just install a Chrome extension and a small software. Then you can choose the option to share the entire window or the selection within the screen. 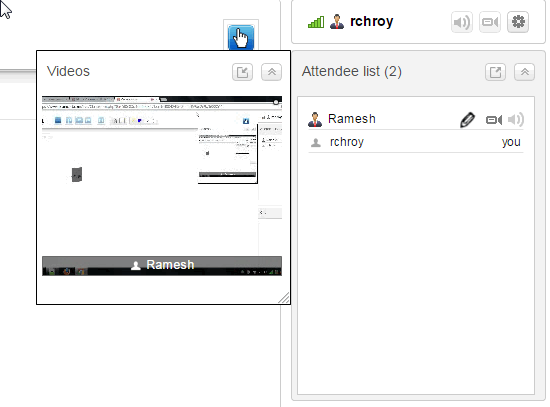 Then a link, and a code is generated which you can share with other users to invite them to join the session. Joining the session does not require any downloads, and registrations. You can share the screen for 30 minutes. It can also be used to capture region and capture window. 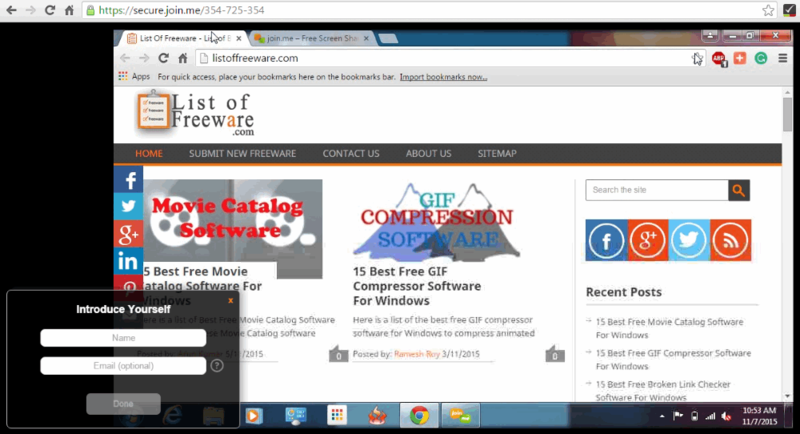 It provides you the option to share the browser privately, or share the screen privately. 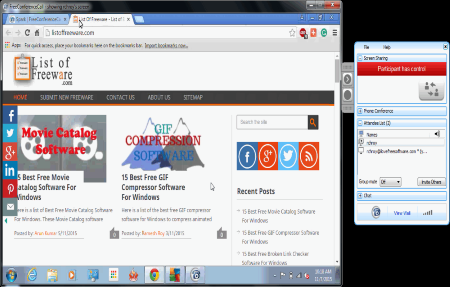 You can also choose the option to broadcast your browser and broadcast your screen. 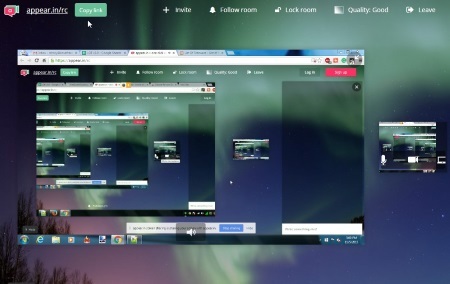 In case you choose the option to broadcast your screen or browser, you can connect with eight users for one hour. Visit the website and click on the button Start Support Session. Then you are provided with the ID, and the link which can be shared with the other user. You can also invite using the Email address. 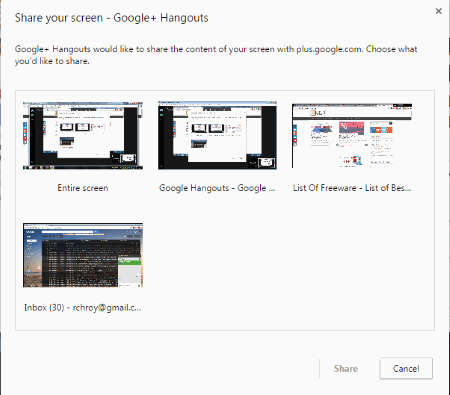 Then the user who wants his screen to be shared has to download a small program, and choose the option to enable sharing the screen, and provide remote assistance to the user. You can also chat with the user, and change the settings as per your internet speed, and the requirement. It also features a chrome extension. 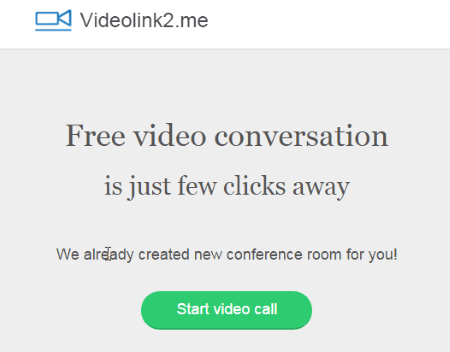 Videolink2.me is a simple website which lets you share screen with your friends. Here you have to simply click on the button start video call. Then a quick guidance is provided. After that you have to choose the option to start either voice conference, or voice and video conference. 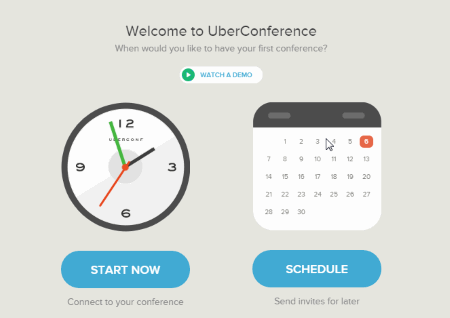 Then you are taken to the conference screen where you are provided with a link to share with the users to start the conference, and add the option to schedule the appointment. Then you are provided with different options to either send message, share screen, send file, photo demonstration and send a selfie. 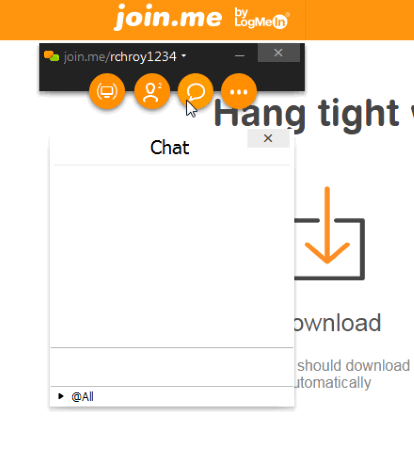 You can also choose the option to share your chat links via Facebook, Twitter, LinkedIn, Google+, VK, or Odnoklassniki. You can also check out its chrome extension. 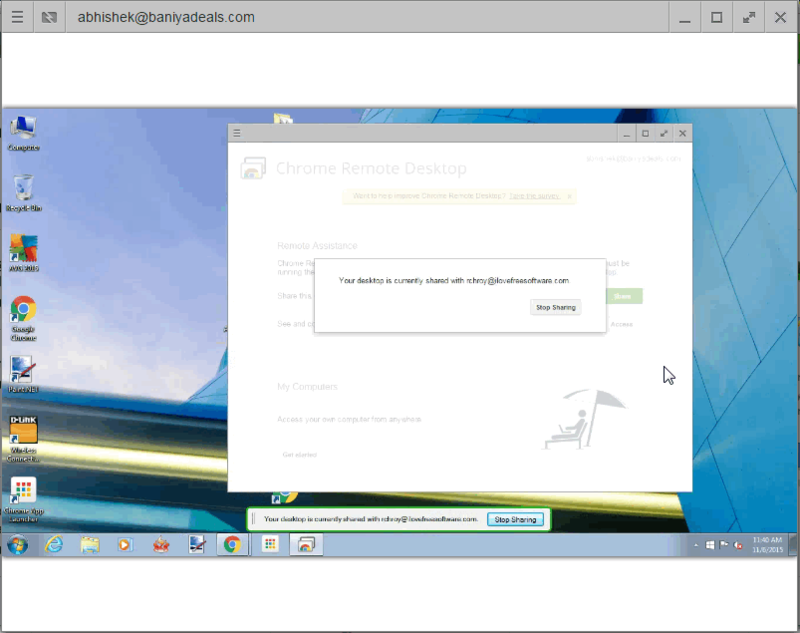 Chrome Remote Desktop is a simple and easy to use Chrome extension which can be used to share screen online. Just download the extension and launch the app. 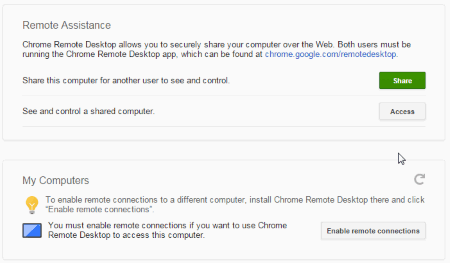 Then you are provided with two options to either share your computer, or see and control a shared computer. In case you choose to share the computer option, an access code is generated. The access code can then be entered into another computer app where you have to choose the option to access a shared computer and enter the access code. 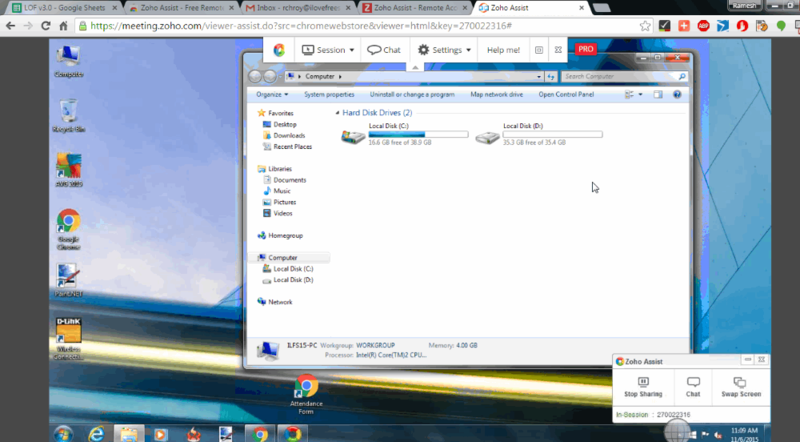 Then the desktop sharing details is displayed. You can choose the option to send print screen, and show statistics. You can also view the host computer in full screen mode. Google+ Hangouts is a very popular hangout feature provided by Google which can also be used to share screen online. In order to do that you have to simply signup for Gmail. Then you have to open the chats option and then enter the user with whom you want to chat. You have to then click on the video call option. Then you can choose the option to share the screen. You can also perform text chat using this software. You can also choose the option to perform a group hangout where you can add other users in the group chat. You can also adjust the bandwidth usage, choose the audio, video and speech capture recorder options. You can also make use of the Chrome extension. 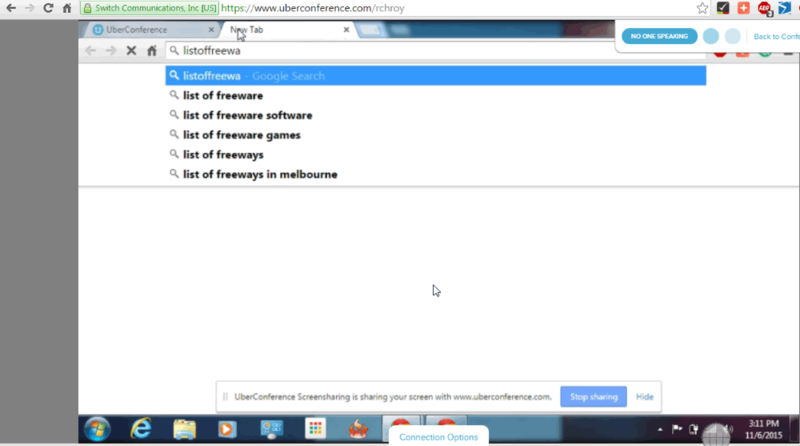 FreeConference.com is a good and aesthetically beautiful website which can be used to share the screen. In order to do that you have to firstly sign up. Then you have the option to create conference calls, which can be started right at the moment, or schedule it for later. In case you want to schedule the meeting later, you can enter the meeting details and then send invitations to the members with whom you want to attend the conference. You can also mute the audio, video, drop the calls ,and perform text chats. 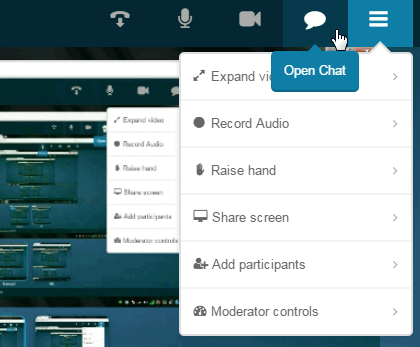 There are several options provided where you can raise the hand, record audio, change video size, share screen, add members, and access moderator controls. appear.in is a simple and easy to use website which can be used to share screen. Here you have to simply create your own custom link, and then you are good to go. You can invite eight friends to have a chat with you and you can also see each others screen. But it requires you to download the Chrome extension. The invites can be sent to the Facebook contacts. You can also choose the option to follow room, lock room, and leave the room. It also displays the signal quality. You can also chat in the groups easily. By signing up you can remember the data and the users. You can also disable sound and camera. join.me is a simple website which lets you share the screen for free via website. In this only the presenter needs to download the software and the viewer can see the shared screen via the website. In order to do that firstly you have to register into the website, and then login to the website. After that when you choose the option to start the meeting then you have to download the software. 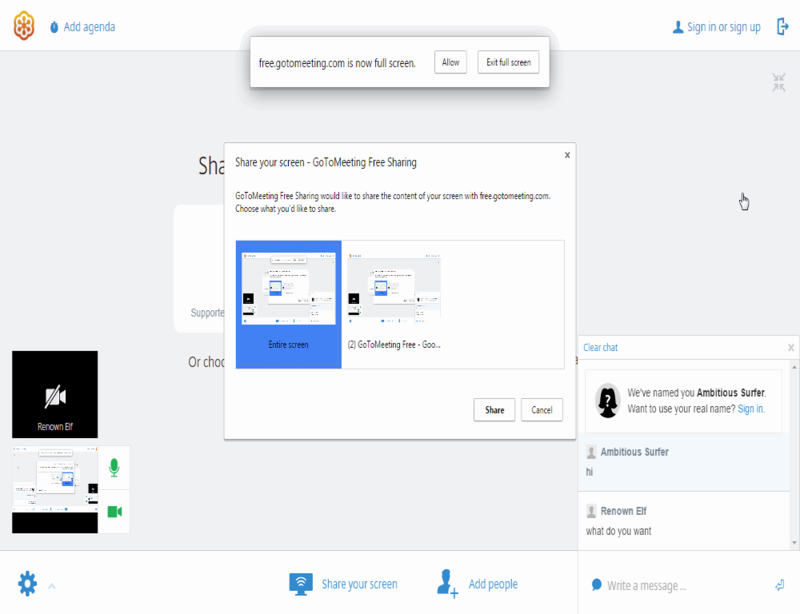 Then you can start the meeting and choose the option to share the screen, which can be then viewed by the viewers, after they choose to enter the meeting and enter the meeting ID, or by directly entering the URL. 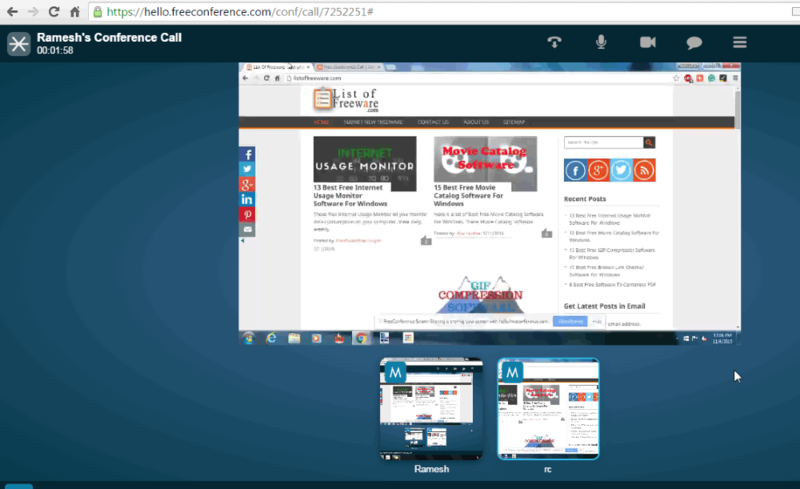 FreeConferenceCall.com is a simple website where you can host meetings for free and also share your screen with others. Firstly you have to register to the website. Then simply click on the option host meeting under the tab online meetings. When you do that you will be notified to download and launch an app. After that your meeting will start and then you can choose the option to share the screen. Then you can also chat with others, mute the group, invite someone, disconnect someone, and allow some other person to become the presenter. In order to join the meeting you have to enter the meeting ID or click the URL. 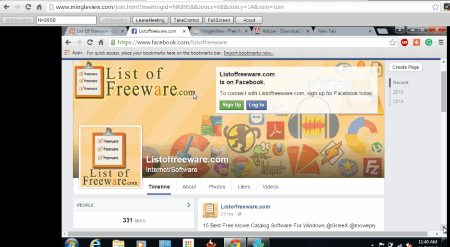 FreeScreenSharing is a simple website which lets you share screen right from the browser. In order to do so you have to create a free account. Then choose the option to host a meeting. Then your screen is being shared. You can invite others and chat with the group. The person invited has to enter the name, email id, and password to enter the chat. You can also choose to switch presenter and view the attendee list. In case you wish to join the meeting you can just enter the name, email id, and the meeting ID. You can add up to 1000 participants, and also do audio conferencing. Spreed is a simple and feature rich website which lets you share your screen for free with two other persons. In order to do that you have to firstly register to the website. After verifying your account you can choose the option to host and manage your meetings. You can choose the option to start the meeting at the given moment or choose to schedule the meeting. You can add recipients and choose the option to mail them about the meeting schedule. 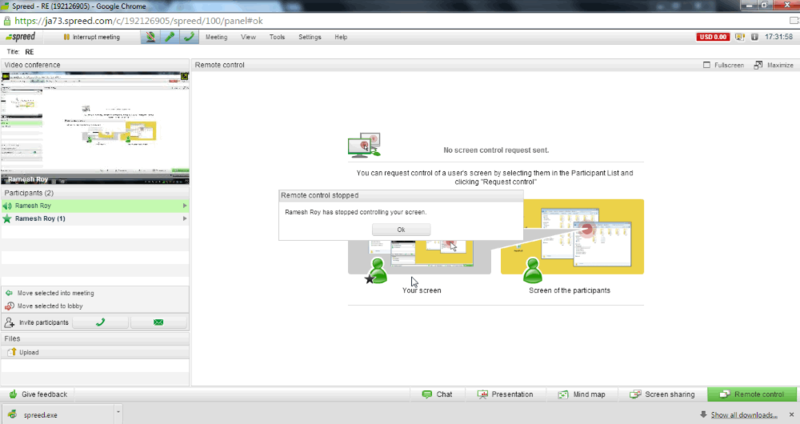 You can choose the option to either chat, make a presentation, make mind map, share the screen, or remote control the PC. MingleView is a simple website which can be used to view the shared screen. The person who wishes to share the screen has to download a software in order to start the meeting. The person wishing to join the meeting has to simply enter the code to join the meeting, and can take control of the session.